The result of over two decades of research, CACI (Computer Aided Cosmetology Instrument) facial toning treatments have been voted the most effective anti-ageing skin rejuvenating treatments available. 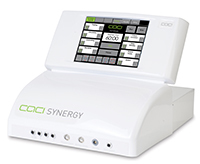 CACI works by combining the stimulation of a unique patented electrical waveform with the naturally occurring bio-electric current of the body to achieve visible results on sagging muscles and skin tissue without the need for invasive needles or surgery. With state of the art design, and incorporating the latest advancements in electronics, the non-invasive CACI treatments are at the forefront of aesthetic treatment technology. CACI technology has a wide range of treatment applications, including deep lines and wrinkles, aged hands, acne and blemishes, sun-damage, pigmentation, dehydrated skin, under-eye bags and dark circles, crow’s feet, jowls, forehead furrows, and nose-to-mouth and top lip lines. CACI treatments regularly capture media headlines and have a significant celebrity following. Now you can have this amazing treatment too. An ideal lunch time skin boost or a prelude too many other facials to give increased benefits of your chosen facial treatment. Microdermabrasion is a cosmetic procedure in which the stratum corneum (dead outermost surface of the skin ) is partially or completely removed by light abrasion. The procedure is not painful and requires no anesthetic. Microdermabrasion can be used medically for scar removal when the scar is raised above the surrounding skin, but is less effective with sunken scars. Microdermabrasion can also be used to improve acne but must be repeated periodically to be effective. This treatment uses a combination of specific waveforms and ultra low frequencies that work in harmony with the body‟s own bio-electric field. The electrical energy stimulates and re-educates the muscles to either relax or contract. Consequently, muscle tone is improved, facial contours are re-defined and lines and wrinkles are softened and smoothed. The latest and most advanced Non-Surgical Face Lift Treatment from CACI, incorporating the original lift with a deeply exfoliating Microdermabrasion with phototherapy skin rejuvenation, Finishing with the powerful intensive hydrating and skin firming Hydratone treatment. This really is the ULTIMATE treatment for your face. This treatment incorporates all the treatment technologies of the Ultimate Facial, focusing on eyes only. The original non-surgical face lift with extended lifting in key areas of concern i.e. brows, eye area, cheeks, jaw line. If you’re looking for the ultimate treatment to smooth away the years and target loose muscles around your neck and jawline, the CACI Neck and Jowl Lift is the Ferrari of the facial world. Special applicators lift, firm and redefine your facial contours by releasing tiny electrical signals to target sagging jowls. Most people find this experience completely painless and you’ll enjoy visible results without surgery, anaesthetic or downtime. For best results, our qualified therapists recommend a course of 10 treatments over five weeks, followed by monthly top ups. The original non-surgical face lift by Caci, focusing on the eye area only. CACI uses tiny micro-currents to tone, lift and re-educate muscles whilst also improving damaged skin tissue. It also stimulates blood circulation and softens fine lines and wrinkles. How many treatments will I need and for what duration? The number of courses required depends on age and muscle tone, and can vary from 6 to 10 treatments. Courses will be tailored to suit individual client needs after an initial consultation. What follow up treatment will I need? Once you have completed an initial course of CACI treatments you will only need to receive a monthly maintenance treatment . Where can I get further information on CACI and CACI Ultimate? The CACI Ultimate brochure is available here. Lisa Snowdon, Model & Presenter. Nicholas Perricone MD, Anti-ageing Expert & Author of Ageless Face, Ageless Mind.